A genuine amethyst gemstone, with its rich, royal purple tones, sits in the center of six small diamonds in this beautiful amethyst trinity diamond ring in 14K white gold from Apples of Gold Jewelry. The SI1-SI2 clarity and G-H color rated diamonds form a small triangle pattern around the deep purple amethyst gemstone, which is an AA rated stone. The amethyst gemstone is 7mm by 5mm in size, and is an oval-cut stone. The richness of the purple amethyst looks lovely with the 14K white gold of the ring, as well as the diamonds, which total 0.18 carats altogether. 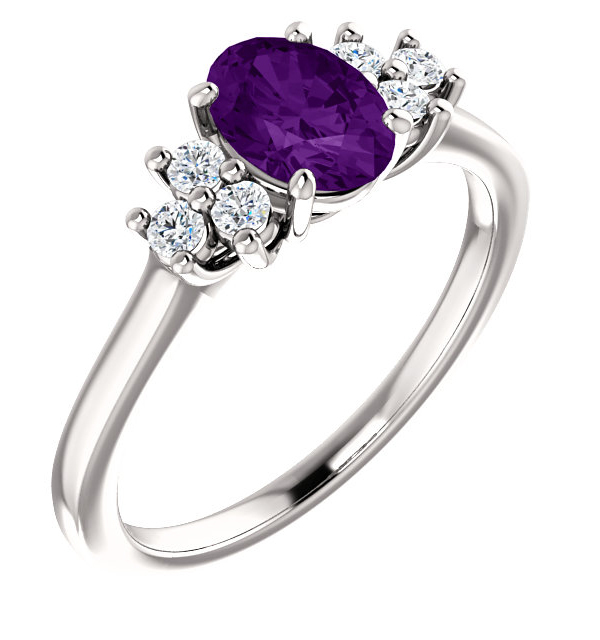 We guarantee our Amethyst Trinity Diamond Ring, 14K White Gold to be high quality, authentic jewelry, as described above.